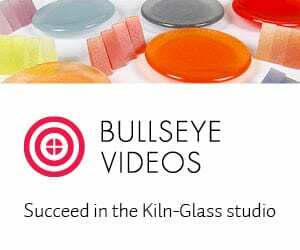 This is a method, similar to the one I describe in my aperture pour tutorial, for creating mixtures of molten glass. The ultimate difference between a mesh melt and an aperture pour is the patterns that one can create. Otherwise, they are similar processes. A basket of wire mesh is created and supported by kiln furniture. Sheets of glass are arranged on top of the wire mesh. Wire rabbit fencing or “hardware cloth” works well. It should not be galvanized – or the zinc in the galvanized coating causes toxic fumes. Photo taken around 1600F. 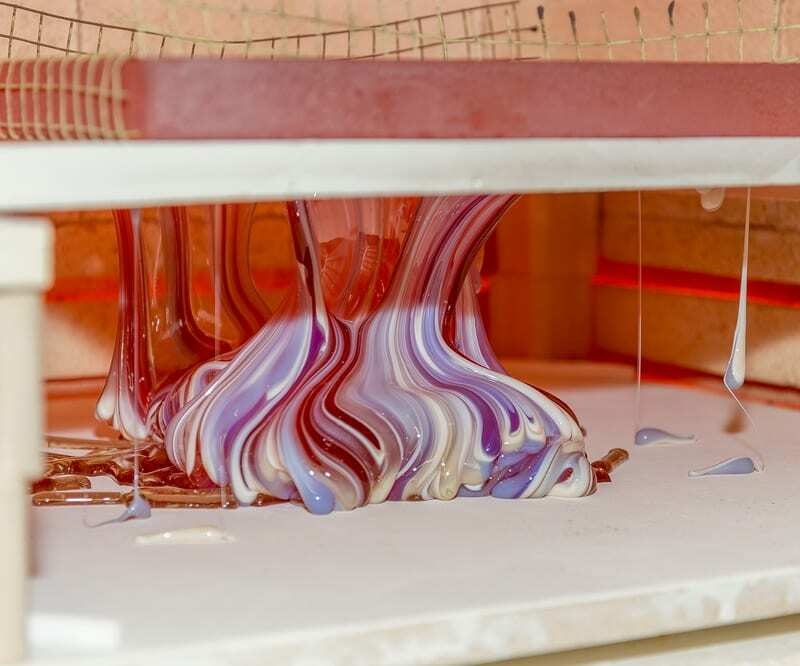 This melt was allowed to flow directly onto the kiln shelf. As the temperature increases toward 1700F the glass cascades down through the mesh onto the shelf. Important: If you are going to look into the kiln at 1700F you must take certain precautions. Wear protective eye-wear, and even better a face shield. 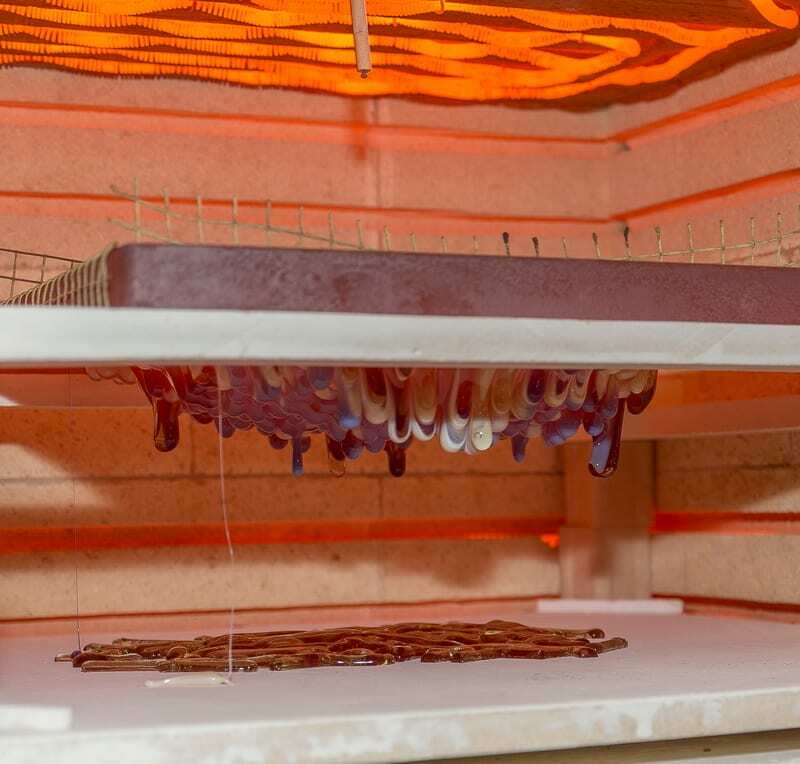 Wear protective high temp gloves as you open the door to the kiln. Be aware that synthetic fabrics are dangerous at these temperatures. It is safer to be wearing cotton. Synthetics can burst into flame or melt causing burns. 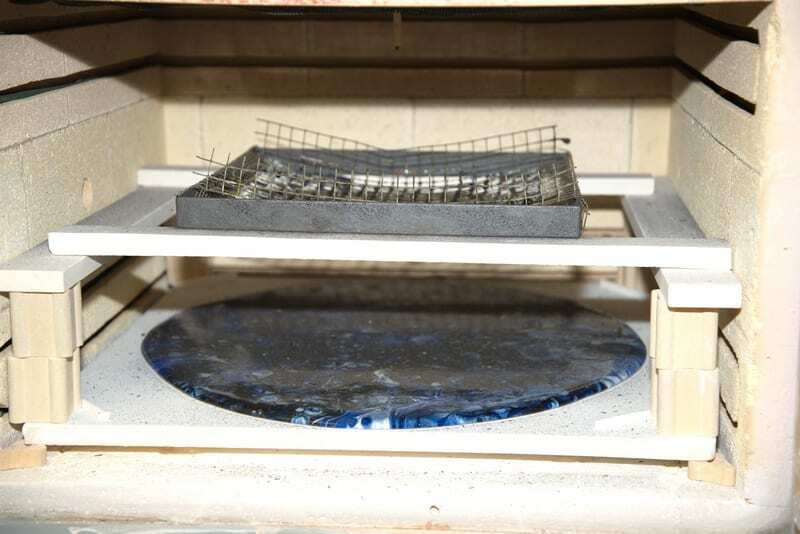 It is best to avoid opening the kiln when it is at 1700F. The only reason I did here is to take this photo. 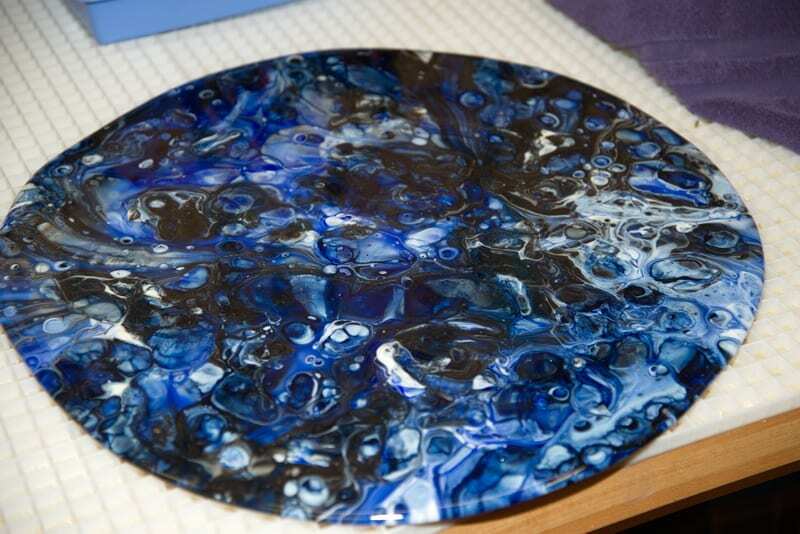 The finished melt, cooled and removed from the kiln. Note: These melts will always have some kiln wash (a.k.a. 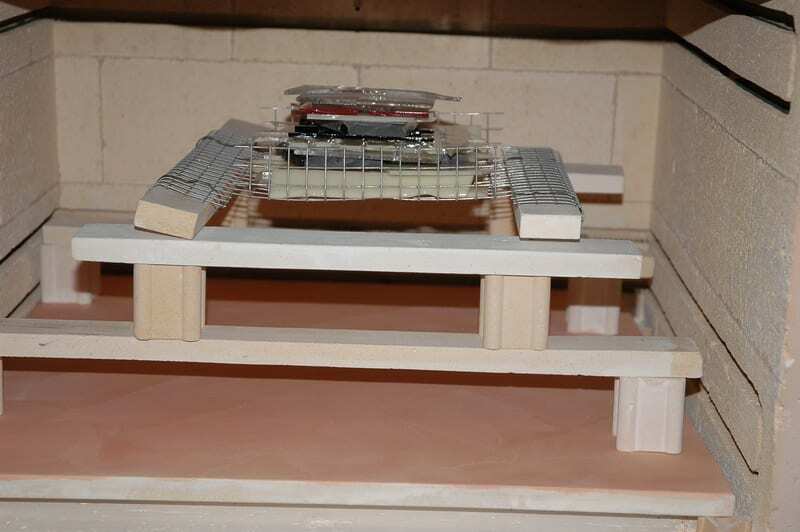 shelf primer, shelf separator, etc.) adherent to the back. This will need to be sandblasted off, or removed by some other method. 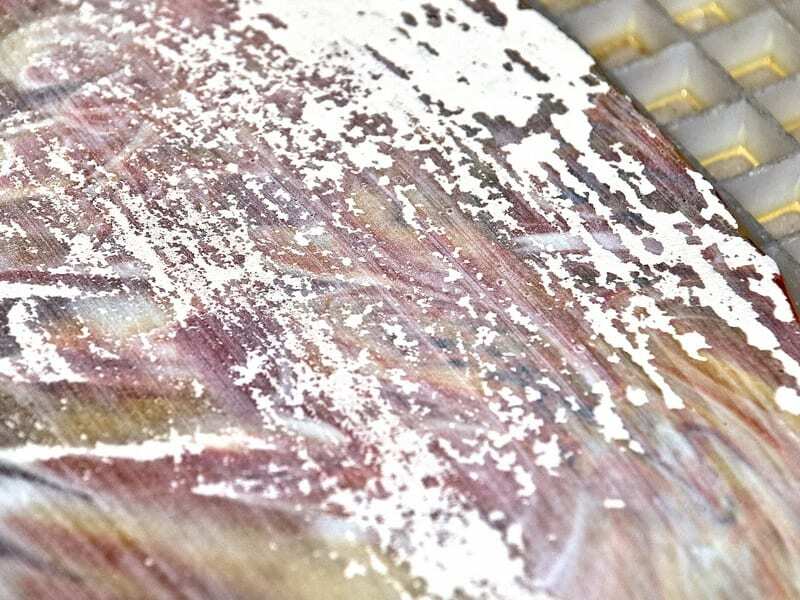 A sandblaster is the best tool to remove kiln wash adherent to the back of any fused glass.